Dan returned to Skopje on Tuesday. Before he left Washington DC, he had begun to be sick. By Tuesday night he had a 39.7 C temperature (103.4 F). He later found out that most of the people staying at the Georgetown University Hotel also became sick with a similar respiratory illness. My body valiantly tried to avoid all contamination, but by Friday night I was also sick. On Saturday my temperature rose to 38.7C (101.6F), and I was in bed most of the day. Kali Cat did a reasonable job as nurse Nightingcat, but she really needs thumbs to be truly effective. Today, Sunday, I hope I am well. Dan is still hacking, coughing, and spreading his germs all around. 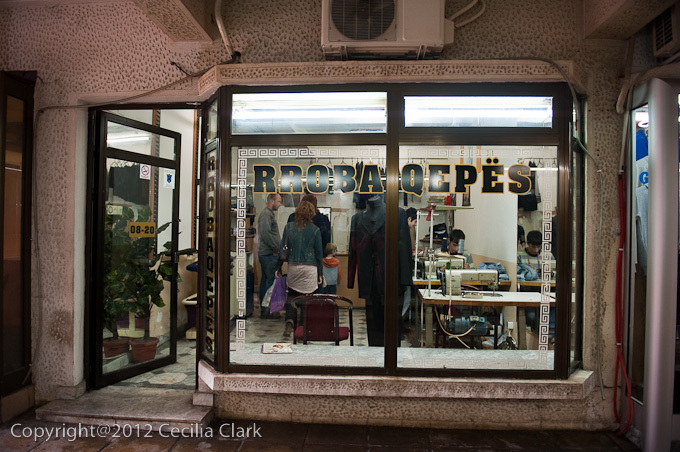 On Friday before I got sick, I went with some friends (Cassidy, Erin, Anjeanette and her husband Dan, and their two kids) to the town of Tetovo to visit a tailor shop. 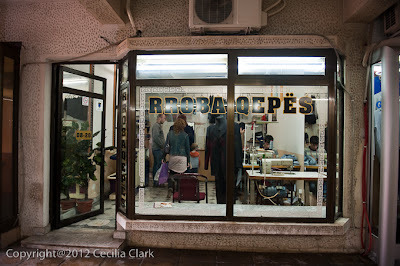 Cassidy, our one-time cat sitter, agreed to introduce us to a Tetovo tailor she has used and was pleased with. Tetevo is a 40-minute drive west of Skopje. We traveled by a small van called "Kombi". The one-way fare was 100MKD or about $2USD. On the way to Tetovo, the Kombi driver had his window open and soon Dan (Anjeanette's husband) also opened his window. I welcomed the breeze as it was a little warm in the rear of the van. This cross breeze is referred to as "promaja" in Macedonian. The promaja is an insidious intangible that brings, cough, cold, aching bones to those that feel its breath. I often have two windows open in our apartment because of the uncontrollable central heat. The two windows create a lovely, soft breeze through the apartment. One day during my Macedonian lesson, my teacher who is well educated and traveled, told me I should shut one of the windows because the breeze on my back would make me sick. I complied. Recently, I've heard many other stories from expats about their experiences with promaja warnings. It's an interesting belief, but I am still a skeptic. I put my money on Dan's germs and not the promaja for making me sick. The Kombi dropped us in the town center and we walked to the tailor's shop. Once there, we looked through fashion magazines and were measured by the tailor. Next the tailor walked us to a nearby fabric store where we all picked out the fabrics for our selected fashions. At first glance, the majority of the available fabrics were 100% Polyester. 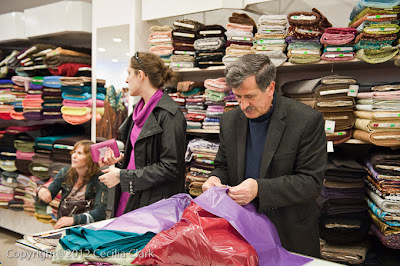 After a discussion with the fabric shop owner, wools, wool-cashmere blends, and cottons were pointed out. 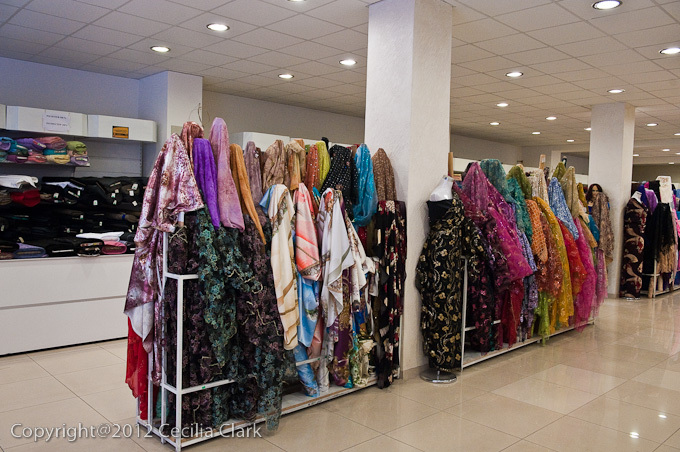 We paid for our fabrics and returned to the tailor shop for additional measurements. I selected designs for two blouses and a pair of pants. I can't wait to see the results. The trip to Tetovo via Kombi seemed so easy that Dan and I will try to manage a day trip to Tetovo some weekend. 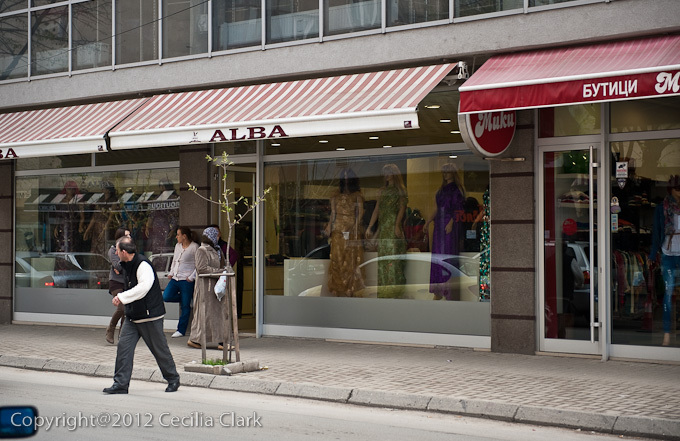 Tetovo, with a mostly ethnically Albanian population, feels quite different than Skopje. Most of the restaurants are along the main thoroughfare as is other commercial business, so even though it is a small town it bustles with activity. An old fortress lies about a 2-1/2 hour walk above the city. Tetovo is also much closer to the surrounding mountains.